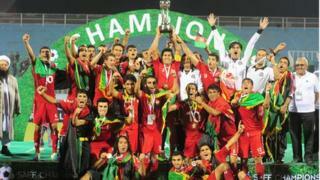 Afghanistan has won its first international football trophy, beating India 2-0 in the South Asian Football Federation Championship final. Afghanistan was already one goal up before half-time, with Sanjar Ahmadi doubling the lead in the second half. The fiercely competitive match was watched by an estimated 5,000 fans at the Dasharath Stadium in Kathmandu. Afghanistan has only recently re-emerged on the world football scene after decades of war and insurgency. There were scenes of celebration and joy on the streets of Kabul, where people crammed into restaurants and cafes to watch the final. Millions of Afghans watched as their side made football history. Restaurants around the country were packed with fans following the game on TV. The match has been the only news here and social media is awash with comments. One fan, Kabeer, described the Afghan players as heroes bringing happiness to a country which has seen so much war. Another, Abdullah, pointed out that Afghanistan has a population of 30 million, while its giant neighbour has more than 1.2 billion. The Afghan team unites the country's ethnic groups - and Pashtuns, Tajiks, Uzbeks and Hazaras were all praying for victory. A delegation which included three ministers was in Nepal to support the players. On this day 12 years ago Afghans could not find out what had happened in the US on 9/11 as they did not have TVs and radios. Today they watched the football broadcast live - what a big change! The Afghan team suffered a humiliating 4-0 loss to India when the two sides met in the 2011 final in Delhi. India, ranked 145th in the world compared to Afghanistan's 139th, has won the event six times. The defending champions missed several good opportunities, says BBC Nepali's Surendra Phuyal in Kathmandu. They did their best to dominate and equalise, but the Afghan defence and its goalkeeper proved too smart for the Indian forwards, our correspondent says. After the match ended, the Afghan players danced on the pitch in celebration with the Afghan flag draped on their shoulders. "You can't imagine how big this moment is for our country, our fans, our team and me," Afghan coach Yousef Kargar said. "We have proved that we belong in the world of football. Our team has improved a lot over the last few years and I am sure we will get better in the years to come." Celebratory gunfire rang out around the Afghan capital. Although not banned, football was severely restricted in Afghanistan under the rule of the Taliban from 1996 to 2001. Football stadiums were often used by the Islamist movement to stage public executions and forced amputations. Sri Lanka, Pakistan, Bhutan, Bangladesh, Maldives and hosts Nepal were the other teams to take part in the tournament, which is held every two years.